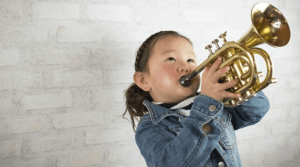 Is Your Child's Instrument Making Them Ill? Is Your Child’s Instrument Making Them Ill? We agree that young kids playing their first instrument look adorable and talented. It’s always nice to see a well-rounded child discovering the beauty of music. What many of us forget, however, is the musical instrument itself and the possible germs it can carry. Bacteria can build up in musical instruments and make anyone sick, from kids to adults. Instruments are always together with the band on buses, in hotel rooms, etc. In 2015, a student marching band of 150 members had to drop out of competition for the DCI Southeastern Championship after coming down with “a progressing, self-limited viral illness” among the corps. When not properly cleaned, these amazing instruments can also carry with them unfortunate germs for our children. Take, for example, woodwind instruments. These reed instruments elicit lovely notes but can also deliver lots of bacteria. Studies show that more than one-half of these musical instruments contain the Bacillus bacteria (stomach flu). In addition, Streptococcus and Staphylococcus bacteria can invade the woodwinds. Tubas, horns and other brass instruments might look and sound powerful, but they, too, are vulnerable to a variety of germs that can lead to illness. For instance, testing done on these instruments yielded interesting finds. Staphylococcus aureus was sitting on about three percent of the brass that were studied. This kind of germ can cause staph infections, pneumonia, and food poisoning. Viridans streptococci was discovered on about six percent of the instruments tested. The bacteria can lead to abdominal and/or respiratory infections. It’s important for parents to teach our children how bacteria develops and why it’s essential to clean musical instruments that come in contact with our mouths and hands. Experts say that woodwinds should be cleaned after every session. Moisture is something to be avoided. It’s recommended that the reed is rinsed thoroughly and dried with a soft cloth. Store the woodwind flat in a cool, dry place. Avoid placing the instrument near high humidity. An experienced children’s dentist of Elkins Park also advises parents to teach their kids never to share musical instruments. When cleaning instruments, the mouthpiece isn’t the only part that requires care. The entire musical instrument should be taken apart to halt the invasion of germs. The band director can show kids how to follow sanitary-friendly steps. Here at Jenkintown Dental Medicine, we are leaders in family dentistry. We take great pride in our friendly, gentle approach to ensure your child is comfortable and develops good oral hygiene habits early in life. Set up a consultation with us today. We offer the finest in general and cosmetic dentistry.